Last week I published the results of an analysis that focused on ambassadors who are active on twitter in addition to their embassy. My results indicated that some ambassadors add to their embassy’s digital diplomacy impact by publishing engaging content. This week I decided to return to my database in order to identify best practices for ambassadors on twitter. Using my data set, I identified tweets published by ambassadors that received an especially high number of re-tweets. 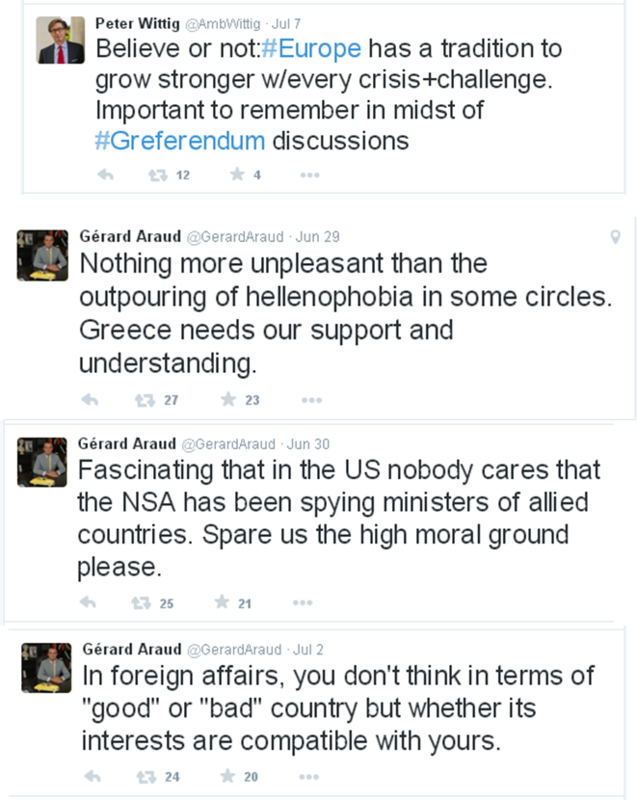 For instance, the average tweet published by the French ambassador to the US receives 8 re-tweets. Yet some of his tweets receive more than 40 re-tweets. Using a sample of nine ambassadors to the US (France, EU, Norway, Finland, Sweden, UK, Italy, Israel, Qatar), I evaluated all tweets that received an exceptionally high number of re-tweets. This produced a sample of 30 tweets which were then analyzed for recurring themes. In total, seven themes were identified. Challenging the media- The interaction between MFAs, embassies and the media is of special significance as the media creates the frame, or prism, through which international events are presented to the domestic audience (i.e., how USA Today present the issue of EU immigration polices). Yet in the age of social media, nations and their ambassadors can challenge the media’s portrayal of events and present their own stance on the issue at hand. Ambassadors’ tweets that comprise this theme are those in which ambassadors challenge media portrayals of issues. 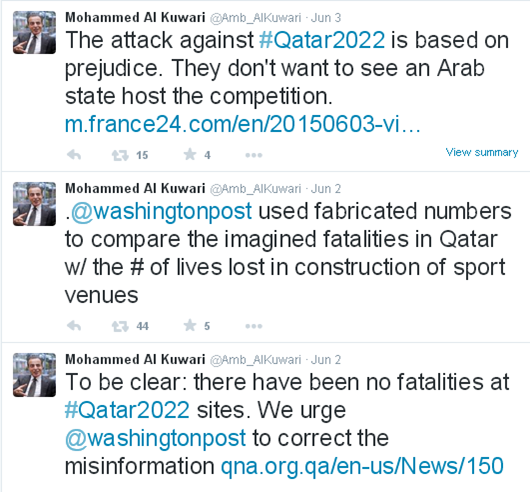 Such is the case below in which Qatar’s ambassador to the US attacks the Washington Post for publishing inaccurate information regarding the number of fatalities in the construction of Qatari sports venues. The popularity of such tweets is of special importance to ambassadors as they may indeed use twitter to either correct information about their country or challenge media portrayal of issues as demonstrated in the tweet below by the French ambassador. Such tweets may be appealing to followers as they offer the promise of a “no spin” version of events. 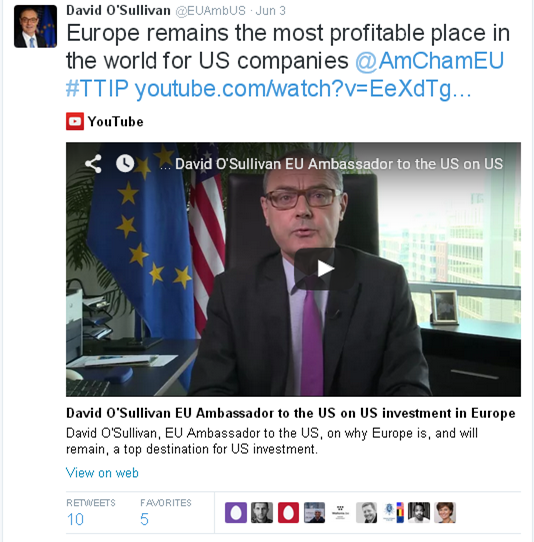 This is exactly the promise made by the EU’s ambassador to the US in the tweet below. Of course it should be stated that the ambassadors’ portrayal of events is also a form of framing. Yet social media followers may benefit from such tweets as they offer more than one perspective on global events. Indeed, the second theme identified related to instances in which ambassadors framed their own nation. Framing the nation-Tweets belonging to this theme were those in which ambassadors highlighted certain aspects of their countries in an attempt to manage their nations’ brands. As framing is a result of selection and emphasis, one may also frame his own country. 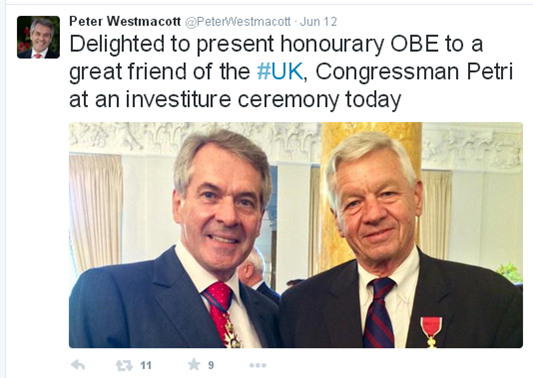 Such is the case with the tweet below in which the UK’s ambassador has knighted a former US member of Congress. This tweet highlights the uniqueness of British culture, heritage and tradition. Finland’s ambassador to the US published a tweet according to which her country was the least fragile one according to a new index while the Italian ambassador shared articles portraying Italy’s Prime Minister, Matteo Renzi, as “young and idealistic”. 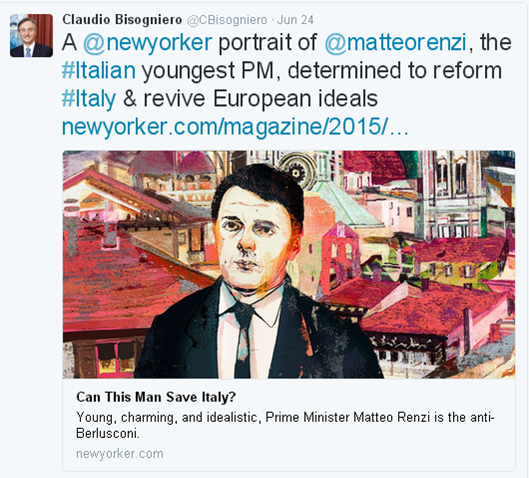 The Italian ambassador’s use of such links may be an attempt to associate brand Italy with brand Renzi. The reason such tweets may resonate with social media followers is that they offer a glance of foreign countries’ cultures and achievements. Another possibility may be that these tweets are re-tweeted by Italian’s following their ambassador to the US or by the Finnish diaspora in the US who is proud of its country. Whether they are promoted by local audiences or Diasporas the popularity of these tweets are also of importance to ambassadors who may use twitter to brand their nation. Must reads- The third theme identified dealt with instances in which ambassadors share their experience and insight with social media followers. Such activities can take many forms. 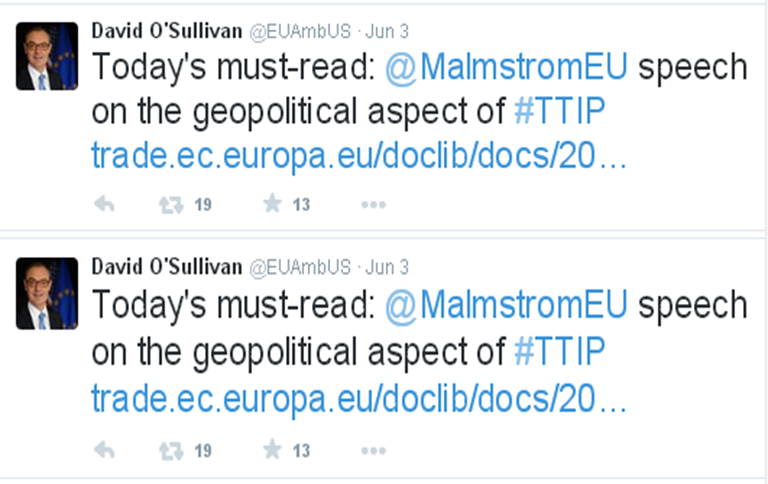 For instance, the EU’s ambassador identifies “must read” articles for his followers. Confronted with a never ending sea of online information, social media followers may view such curating by the ambassador as a reader’s guide endowed with the ambassador’s experience. 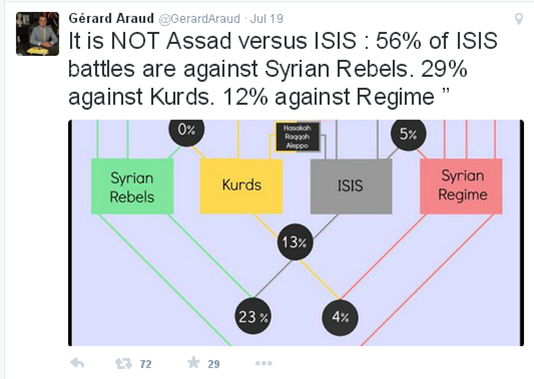 Another form of curating, often employed by France’s ambassador to the US, is sharing analysis and information with followers. Such information may not have been authored by the ambassador but by sharing it he is endorsing this information. Finally, ambassadors can link to content they themselves have created such as an Op-Ed article written by Israel’s Ambassador to the US. In addition, ambassadors upload videos in which they offer analysis of events taking place around the world. Some of the videos shared by ambassadors in my ample were rather long suggesting that audiences may be seeking in-depth analysis of world events rather than 140 spurs of diplomacy. Shared values- This theme includes tweets in which ambassadors highlight the values their country shares with the US. These tweets may be appealing to social media followers as they make bi-lateral relations more tangible. They offer an answer to the question- why are France and the US such close allies? The answer stems from the two countries’ shared values, norms, beliefs and even history. 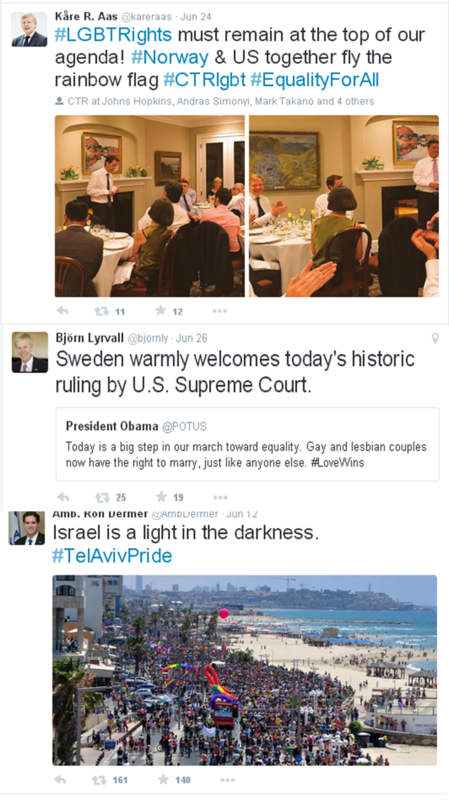 Interestingly, ambassadors’ tweets that dealt with shared values were always timely. Such was the case with a French tweet ahead of the US 4th of July celebrations, the anniversary of the Magna Carat and British democracy or tweets about LGBT rights following the US Supreme Court ruling. 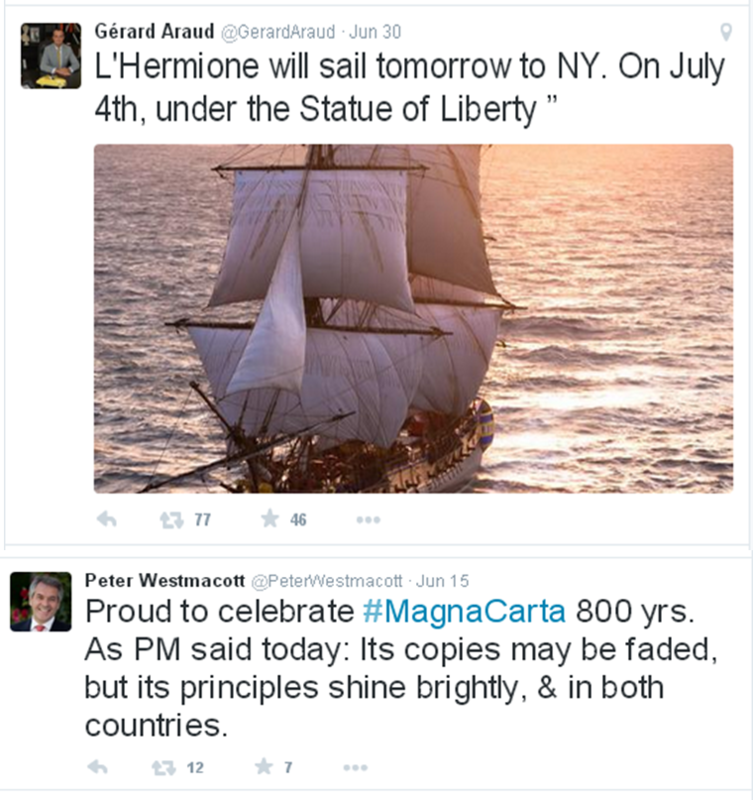 Theses tweets indicate that some ambassadors have indeed mastered the art of Twiplomacy which is all about timing. The Business of the US is business- Tweets dealing with trade agreements, employment rates and financial markets are relevant to any audience any time. Many of the ambassadors’ tweets that comprise this theme place an emphasis on how financial relations serve both nations. 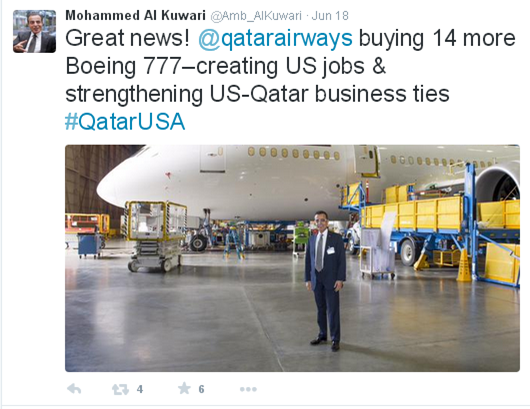 This is best exemplified by the tweet below published by the Qatari ambassador boasting his country’s contribution to US employment. 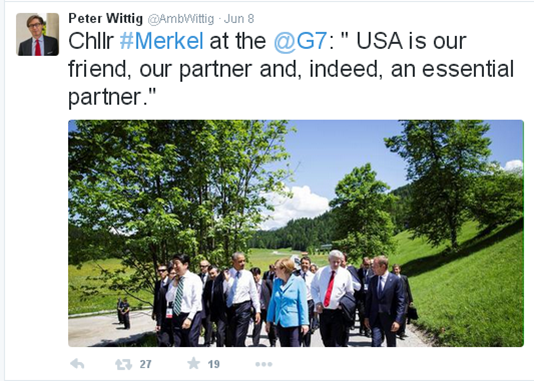 Similar tweets were published by the EU’s and Germany’s ambassadors to the US. I do however find myself wondering if such tweets are especially relevant in the US given that its main business- is business. If this is indeed the case, then such tweets are actually tailored to the local culture thus explaining their appeal. Behind the scenes look at diplomacy- Some ambassadors seem to use their twitter account in order to offer followers a behind the scenes look at international diplomacy ranging from their own activity in Washington to international summits. 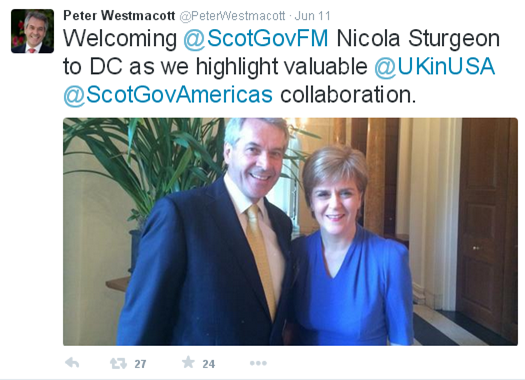 Such content may be appealing to regular followers far removed from the inner circles of trans-Atlantic diplomacy. 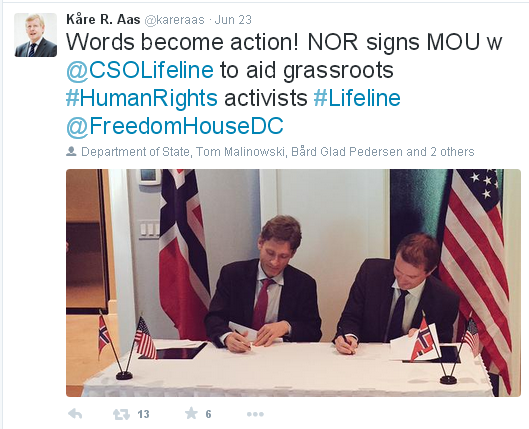 Other ambassadors also use their account to offer followers a look at their everyday work as diplomats ranging from meetings with policy makers to advancing cooperation with civil society organizations. 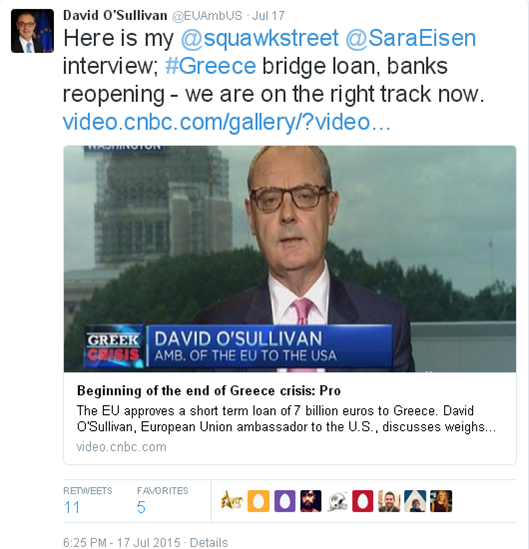 A unique voice- Finally, it is important to note that some ambassadors have developed a voice of their own while tweeting. 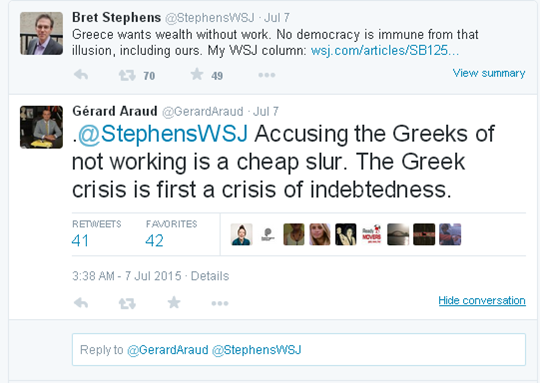 These tweets, that are often honest and argumentative, seem to break from diplomatic protocol. Yet by so doing, they create a more attractive online persona with which social media followers may want to engage. In summary, ambassadors looking for best practices on twitter might benefit from the experience of their peers in the US. This analysis, which evaluated popular ambassador tweets, suggests that social media followers are interested in the analysis offered by foreign policy experts such as ambassadors and thus appreciate their curating of information. Followers also seem to be keen on in-depth analysis that transcends the 140 character limit of twitter. Tweets that seem to especially resonate with followers deal with shared values and shared concerns (e.g., the economy) as these are tangible examples of why two nations have established lasting bonds. Finally, an ambassador’s unique access to international diplomacy and his unique voice are also much appreciated by social media followers. Interestingly, the activities of the ambassadors in this sample fit all the stages in the framework proposed by Heine and Turcotte which identify three levels of twitter use for diplomats: a basic stage in which embassies and diplomats tweet official statements and links to speeches and press releases, a personalized stage in which diplomats serve as media guides by tweeting articles of interest to them and an advances stage where diplomats engage in debate and do not shy away from voicing their own opinions. 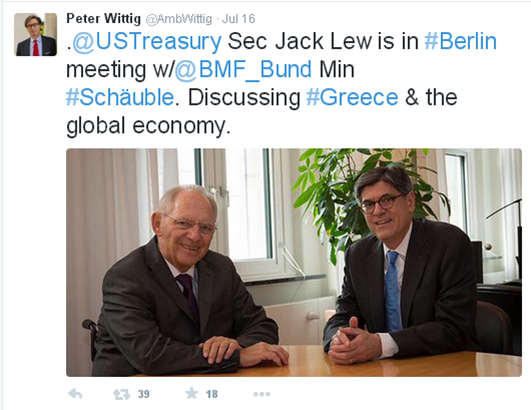 Posted in Uncategorized and tagged Ambassador, analysis, best practices, Digital Diplomacy, twiplomacy, Twitter, US. Bookmark the permalink.